Sorry, the Bellaire Inn no longer has boat parking available. 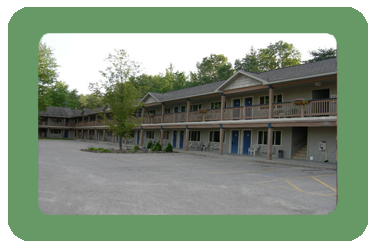 However, boat parking is available directly across the street for $10 per boat per night. North of Central Lake, are six narrow lakes that complete the Chain O’ Lakes system. Starting with Hanley Lake then north through the Green River to Wilson Lake. Between Hanley Lake and Benway Lake an old lift bridge runs over the Green River on Muhrman Bridge Road. It has been inoperative for some time and has a clearance of only five feet. 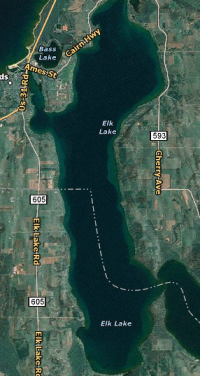 As you head north through Wilson Lake, and just before you reach Ellsworth Lake, there is another small private bridge at five foot clearance. 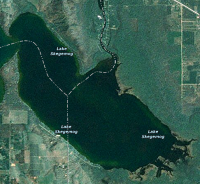 As go further north through Ellsworth you reach the northern most lake, St. Clair Lake. You must pass through a 12 foot wide culvert with five foot clearance and 3 feet of water to reach it. 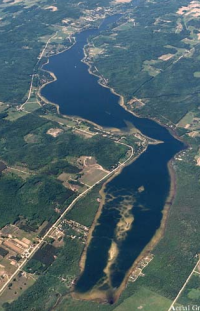 The Chain O’ Lakes turn south from here through marsh land and into Six mile Lake, the largest of the northern lakes. Due to the connecting rivers smaller boats are recommend for this Michigan fishing tour. Intermediate Lake is part of the Chain O’ Lakes in Antrim County Michigan. It is connected to Intermediate River to the south, and to Hanley Lake through Green River to the north. Fishing Intermediate Lake you will find a variety of game fish such as trout, walleye, bass, pike, perch and many more. 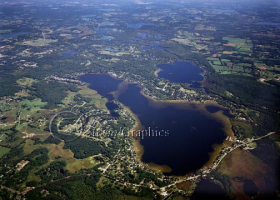 Lake Bellaire is part of the Chain O’ Lakes in Antrim County Michigan. 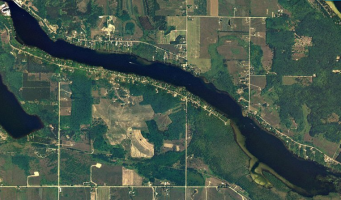 It is connected to Clam Lake to the south by the Grass River, and north to Intermediate River. Fishing Lake Bellaire you will find a variety of game fish such as trout, walleye, bass, pike, perch and many more. Lake bellaire is a small but deep lake with a maximum depth of 107. The depth allows for trout fishing but still offers plenty of shallower depths, weed cover and river beds for fishing many different styles. WIDTH : max. 2.35 miles. DEPTH : max 315 ft. ave 111 ft.
BOTTOM : Shoal - sand, gravel, rubble, marl. 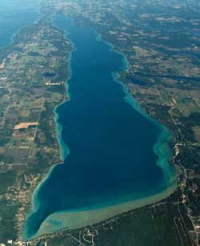 Torch Lake, at 18 miles long, is Michigan’s longest lake. 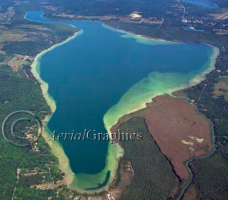 Torch Lake also is Michigan’s second largest lake covering over 29 square miles. Torch Lake, with an average depth of over 200 feet, is a fine habitat for trout. Downrigger fishing is the best way to go after the trout that stay in the cold depths most of the time. Lake trout, rock bass, yellow perch, small mouth bass, muskellunge, ciscoes, brown trout, rainbow trout, whitefish. Lake Skegemog, is part of the Chain O’ Lakes in Antrim County Michigan. It connects west into Elk Lake, and to the north through Torch River to Torch Lake. Lake Skegemog, formerly known as Round Lake, is a shallow lake with many logs and stumps. The entrance to Torch River is directly across from the Pine Haven Cabins on the south west shore. Head north east once you line up and you should find a narrow channel through a field of stumps and logs. The logs make good cover for a variety of fish such as, smallmouth bass, large mouth bass, pike, crappie and panfish. WIDTH : max. 2mi., ave 1.4 mi. DEPTH : Max 192 ft. ave 54.3 ft.
BOTTOM : Shoal - sand, gravel, rubble. Lake trout, rock bass, yellow perch,small mouth bass, muskellunge, northern pike, rainbow trout, whitefish.